Ratchet straps are specifically designed to hold loads in place on trucks, trailers, rail cars, ships and other freight carriers. Heavy duty ratchet straps work effectively by ratcheting down tightly over a load. Webbing is made of 100% high tenacity polyester. In accordance with EN 12195-2 or other standard. For European market, US market or Australia market. Long lever for a better force transmission. Low elongation rate lessen the after-stretching. Blue label indicating lashing capacity and breaking force. The cargo lashing are not designed for overhand lifting or towing. Different end lifting is available with different cost. Good after-sale service is offered. 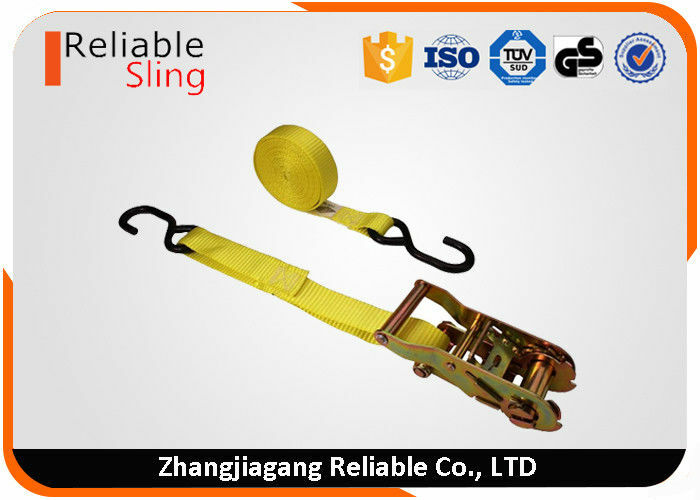 Product Name: Ratchet Strap, Ratchet Tie Down, Cargo Lashing etc. Buckle Type: Ratchet Buckle, Cam Buckle etc. Buckle Size: 1", 1.5", 2", 3", 4"